Lots of love, Happy Valentines! 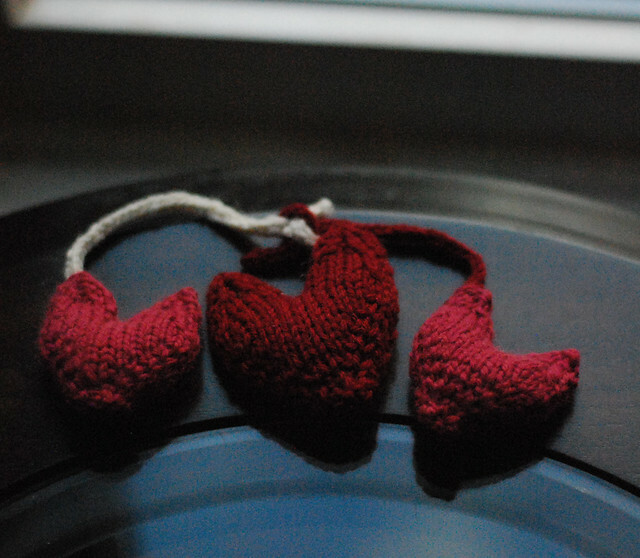 The middle Heart Pin is for T. It used a bit of my remnant Cascade 220 worsted wool yarn. Each side has 4 ends of weaving-in love. Outer hearts are in Sublime angora/merino bought these many years ago as a single ball on sale. They have gone with cards for T’s new teachers. Schooling love started last month. How proud am I? 20 ends sewn-in proud with glitter heart stickers proud! The white tie on our left heart there is also in T’s set of back-up mittens for school. The undyed Cormo Worsted from Sasha Torres’ Sheepspot line of yarns paired with her inky blue to take the edge-off knitting a third pair of mittens. 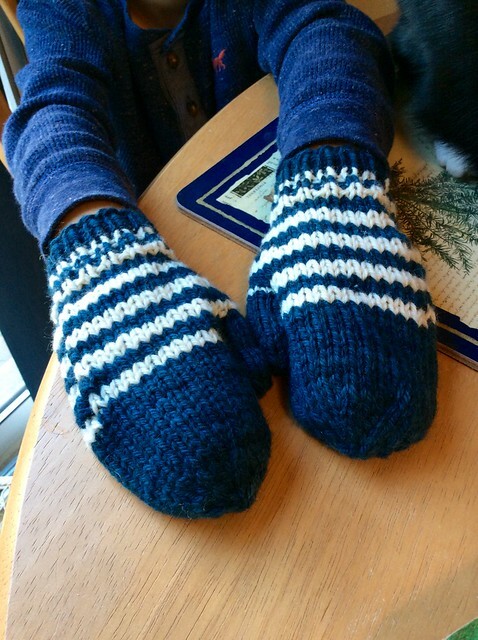 The pattern is Kathy’s Mittens by Chris de Longpré. All 3 pairs are knit in the round. The other 2 (not shown) are solid yarn leftovers from two of T’s sweaters – Peace Fleece and green Rowan pure superwash wool. For this last pair in Cormo, I used 46 yards of blue + 16 yards of natural. With a cuff that I was clearly anxious to stop knitting plus breed-specific yarn, I am happy to send them inside of T’s backpack. What kindergartener is easy on the mittens? One of last year’s happy knit events was a KAL in the Knit/Wit Designs Fans Ravelry group. It fell out of the blog posts at the time but was a fun gift for a dear family friend, Hedy. 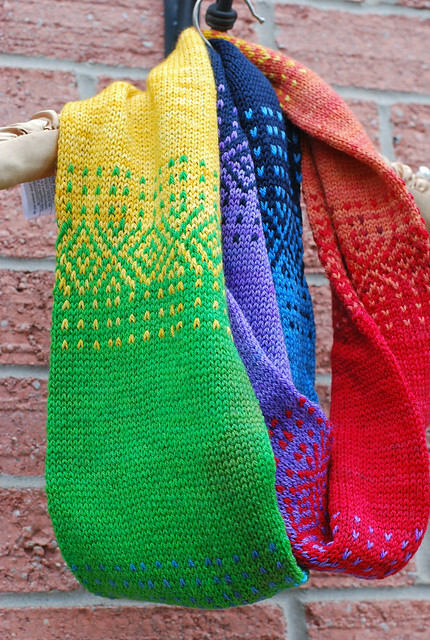 The Sheepy Time Yarns rainbow kit was an obvious choice since the answer to favourite colour that Hedy gives everyone is “rainbow!” This is one in a series of colourwork designs by Sarah Jordan, the Zeccola Cowl. This project is a perfect example of how knitting has worked to naturally stretch my colour horizons. Our friend loves her bright scarf. It is knit in the round, and is probably superb in Sarah’s recommended sport yarn. Fast forward to this year, and Sarah is currently hosting her StitchburghKAL. It runs until Friday, March 3rd & is for patterns in her new collection of the main name. As the image shows this was a 2010 yarn of super density that I spun on my then-new Spinolution Mach 2 wheel. The around 222 yards is not much to hold 8 ounces of Corriedale wool! If you have heard me go on about my grist learning curve – yup, that’s it! 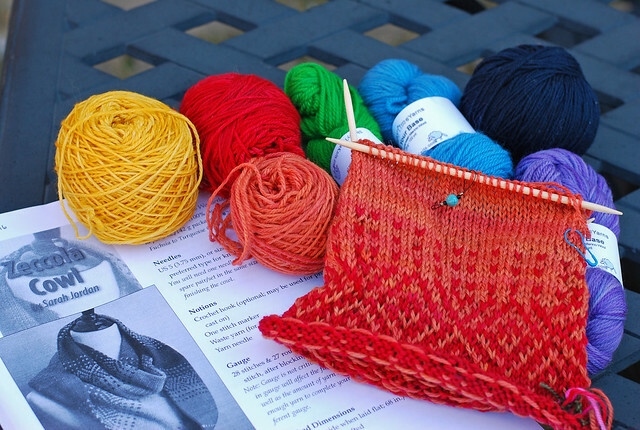 444 yards per pound may not be an easy yarn to plug into most patterns at half that yardage but Sarah has an ingenious pattern in her collection that works for a wide range of yarns. 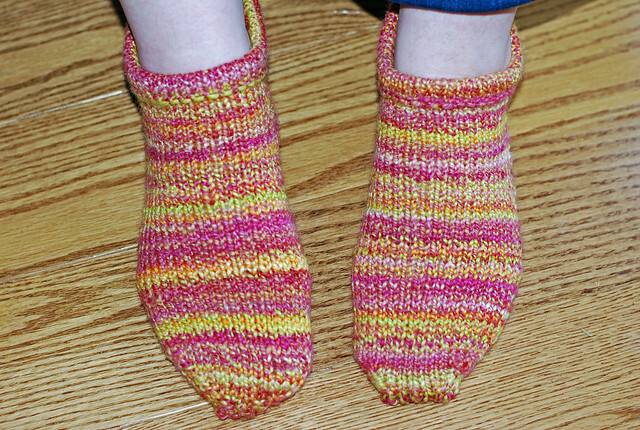 The Pierogi Slipper Socks pattern is written for sport or DK-weight yarn. It worked very well using a stitch ratio approach. I again gave thanks for my Darn Pretty Needles as the 2.75 mm set is unharmed. They worked hard to give me 20 stitches in stockinette stitch in the round. Ah, the brightness! We need the brightness! The colourway is Gumdrops by Sweet Georgia Yarns. I had bought 2 braids from a local spinner’s destash. This tight gauge blends the clearly barberpole yarn into such neat colour bands. 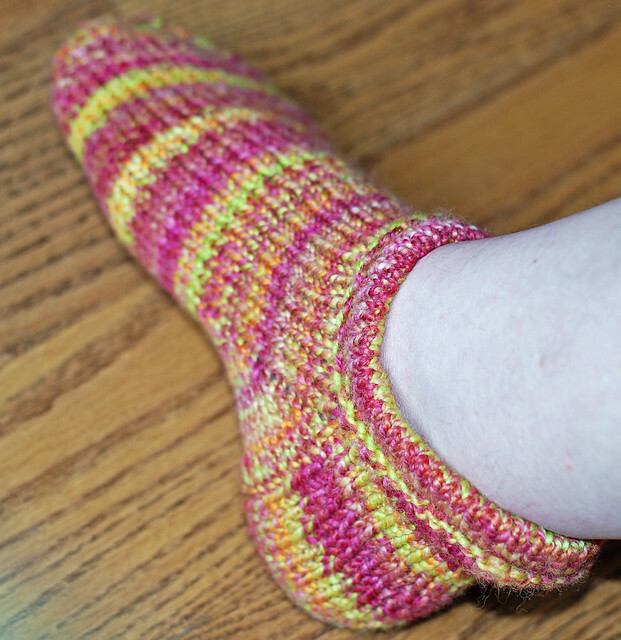 As you can tell, my toe-knitting is still not equal from one foot to the next! It was late? My nutty gauge used approximately 140 yards. The “pierogi” tabs on the hoof! 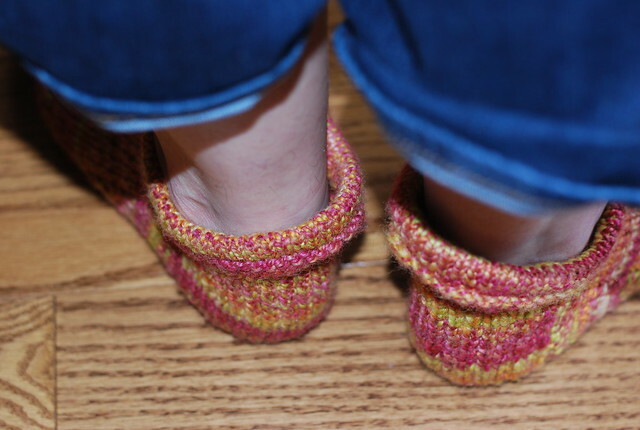 These were a quick-enough knit that joining the knitalong now is definitely do-able. Mine were between January 31 and February 3, 2017. This was my first finished object of 2017. 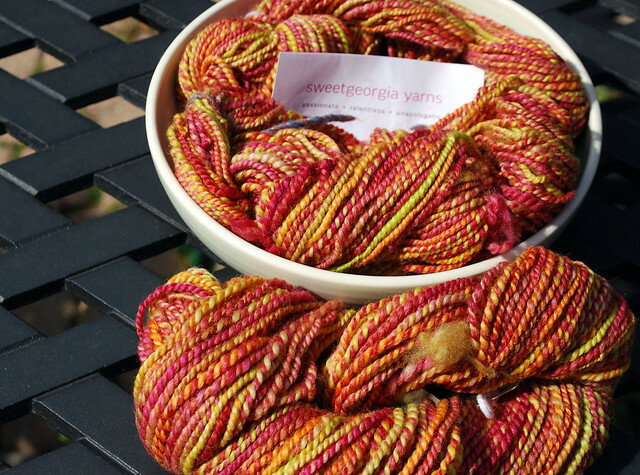 Handspun stash lessening! They are warm and equally nicely, snug. My family lived in Pittsburgh for 4 years when I was around T’s age. It has been cool to read Sarah’s design introductions because I have childhood memories but have not been back since age seven when we returned to live in Jamaica. Categories: Finished & in the wide world, Spinning, Stash in; Stash out | Tags: child knits, colourwork, Cormo yarn, Corriedale wool, cowl, handspun yarn, Mittens, Sock | Permalink. Over the past several days I have been carefully weighing the idea of a Spinolution Mach II as my 2nd wheel. My skein of lavendar Corriedale 2-ply wool is really large. After finishing it came in at 230 yds from 1 bobbin! An endearing feature to say the least. Look, Ma, no ends to weave! Hopefully the garter edge will lay flat on blocking. I’d also like the yarn-overs (holes) to show more. Far be it from me to hide my FO fail/ ugh… Learned my lesson on stashing fibre in quantity! So, the Mach II spins in 1:10 ratio demonstrably well. What gave me pause? Spinning group was underwhelmed. Cool, utterly frank comments included, “It’s not the prettiest thing is it?”; and, “I wouldn’t buy that wheel.” I do have good reasons but they were politely silent. I have lived in Canada long enough to catch the drift on polite silence… Yes, this wheel is out there. If I get it, I better like it because resale is looking decidedly dim. The higher ratios. On testing them, I found the treadling is much, much heavier. And my right ankle isn’t exactly 100% sound. Sheer size. It’s heavy, and cumbersome. If I go through with the Master Spinner’s course next summer, I will need to cart a wheel around. This won’t be that wheel. Single drive system – Scotch tension. I like ST but do want room to learn & use other drive systems. My Wee Peggy can go double drive – is that enough? When I started down this road, I assumed this would be a 2nd wheel; end of story. Now the issues (especially nos. 3 & 4) make this look like a gateway drug. I’m brainstorming & researching hard to see if it could work/ how. Fact is, the out-of-the-box capability of the Mach II has caught my attention. It is unconventional. Maybe I am too. Categories: Finished & in the wide world, Getting the knack, Spinning, Stash in; Stash out | Tags: Corriedale wool, cowl, Equipment, handspun yarn, shrug | Permalink. And now, I really must go! Categories: Finished & in the wide world, Stash in; Stash out | Tags: cowl, Hat | Permalink. I am feeling a tad seasonally affected. Yesterday was cold but today? Well, Toby was very happy to see his wool sweater this morning. Winter is here. We are fleeing south in just a few days, so I really have no business complaining. Courtesy of Mom. She says (on a long-distance call) I must “put it up.” I laughed my head off at that one. We agreed on a don’t ask; don’t tell policy. If you notice, the cop of yarn spun itself. Hand tool used for spinning wool into yarn. I did finish the Wham Bam cowl tout d’suite. With no Malabrigo yarn to spare. Ixnay on the full-face pics. I am looking as tired as I feel apparently. Project name is Instant Cowl. I am torn between getting more skeins to make this for the other 2 sisters, and working my spindle. Torn but leaning in favour of the spindle. Categories: Finished & in the wide world, Spinning, What I'm up to | Tags: cowl, drop spindle, Romney wool, Spinning | Permalink. Turns out, I couldn’t abandon the Christmas knitting entirely. For one thing, I was just in a rut. It’s probably silly to zero-in on stash when knitting for people who have everything except hand knits. For another, the One of a Kind Show wasn’t exactly all that I had hoped it would be. About OOAK – we went but basically window-shopped & then left. The prices seemed steep. That might have been due to the many out-of-province artisans. The Ontario cottage industry booths seemed to be few & far between. A sad thing. Also, the “one of a kind” vibe was missing. Booth after booth was just a variation on the same pottery, beeswax candles, baby things, etc. The hand knits? I do buy hand knits but these were mostly things I have made recently. A bright spot was Island Sweet’s booth. She was against a far wall but completely sold out! Her blog post about the wonderful success is here. The OOAK moral? Go with lower expectations long before the last Saturday of the show! I am still working on a “his” version. If all goes well, the pair could top-off gifts for the newlyweds. Time is running out now – just a week until we’re on our way south (yay!). Lack of time = chunky knit woolen cowl! It’s a Wham Bam thank you Lamb by Susan Chang. My edge is a little modified but that’s it. Another free Ravelry download with over 1,000 FOs. The instructions fit on a post-it note. They are that simple! Knit up in Malabrigo Chunky, azalea colourway on size 11 needles. The lighting was awful for the picture – snowstorms do that. This is my 1st Malabrigo project. It is softer than soft but I have heard how prone it is to pill-on-sight. The size 11 needles are making the stitches mighty cozy & hopefully that will minimize pilling. Not being very clever here – size 11 is as high as my needle collection goes. I really don’t knit chunky yarns very often. The other Defence Against Pilling measure is to have the yarn ball in a ceramic bowl. The fibres better be at peace when they get wrapped! Categories: Fairs & Fiber Festivals, Finished & in the wide world, Stash in; Stash out, What I'm up to | Tags: cowl, Design, Malabrigo yarn, Ravelry | Permalink. Naturally, I glossed over certain realities of life in the tropics & chose this piece of winter outerwear. For her to wear with her blazers at work. Never minding that she doesn’t wear lovely jewel tones but kidding myself that I could win her over to my way of thinking… So, seeing the FO in all its glory, I have faced facts. It is not for MIL. I know exactly who it’s really for & feel much better about the whole thing. No polar bears were harmed. I used ²⁄3 of a skein of Fleece Artist Sea Wool on 3.25mm DPNs. It’s 135 stitches around or 9 repeats of the shield pattern & 8 or so inches high. It did take me almost 2 weeks to make & is def. not mindless knitting. At some points, I just wanted the K2togs to be over! After blocking, I think that the shields/ leaves will show beautifully. The challenge is to find a cravat-like pattern that is A/C & office-friendly. It would be great if that pattern also makes for good knitting. My high school uniform included a tie. 5 years of daily tie-wearing put me off scarves, cravats, neckerchiefs and the like for life! Categories: Finished & in the wide world, Stash in; Stash out | Tags: cowl, lace | Permalink. Not seen on shelves in these parts that’s for sure! It’s a hank of 100% wool, handspun & hand-dyed in Spain. Love it! As for the yardage, it has to be a lot. I’m sticking with “a lot” for now. Seriously, would you pull this apart just to measure yardage? Not me! The back-story is that my brother & SIL were roaming the streets of Barcelona on their honeymoon when K spotted the yarn store. They both speak Spanish & so the owner quickly understood that there is a sister in Canada who knits like crazy & spins. So, now I have this new prize for the stash. Micro-spun, European 2 ply wool. Woo hoo! The idea is this will be great for a Jamaican-themed ital project that I have in mind. In the meantime, it will be making me laugh over there in the den. Also priceless was gift no. 2. A vintage photo of a random boy all dolled-up for his First Communion. Normal right? Well, the photographer has an awesome name & it’s gilt stamped on the front of the pic. There it was just sitting on the top of a pile of photos in a flea market in Barcelona as the happy couple strolled by. It’s the Noble Cowl by Emily Kausalik. A free pattern from her site over there. This gift was fast becoming a leetle problem – I needed a push. Ravellers have come to the rescue. A group, Ontario Knitters Unite inspired me with a good list of free patterns in their Christmas knit-a-long. As Martha would say, “A good thing.” So, I have joined my first knit-a-long & now am happy to say that a direct request for a knitted object will not go ignored. The yarn is Fleece Artist Sea Wool. It’s thinner than the pattern yarn, so I hope the pattern will show well. If not, well, I’ll cross that bridge later. Speaking of bridges to cross… Fall at our house. And this is after 2 bags have already been raked. There’s more to come off that tree & another yard to rake as well. Funnn. Categories: Good Gnus, Stash in; Stash out, What I'm up to | Tags: cowl, Flora, handspun yarn, Ravelry | Permalink.